Providing your cat with good health care, especially preventive health care, can allow her to live a longer, more comfortable life. However, this cannot happen unless you take your cat to see the veterinarian routinely. Many cats dislike going to the veterinarian, and that usually starts with the difficulty of getting your cat into the carrier. 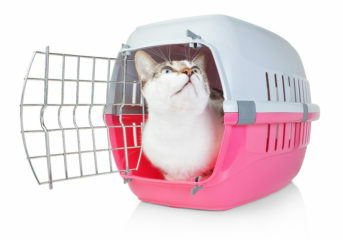 Once you’ve mastered how to get your cat into their carrier, the entire veterinary visit is usually less stressful. Why is My Cat Fearful of Her Carrier? Cats are most comfortable with the familiar, and need time to adjust to the unfamiliar. So, if her carrier is not an object in her regular environment, your cat does not have time to become familiar with it. Your cat probably associates her carrier with visits to the veterinarian’s office which is probably not her favorite place. Respect your cat’s need for time to become familiar with new situations, people, and places. The goal is for your cat to learn to associate the carrier with positive experiences and enter the carrier frequently and voluntarily. Place familiar soft bedding inside the carrier. Bedding or clothing with your scent can make your cat feel more secure. Place treats, catnip, or toys inside the carrier to encourage your cat to go inside. Often, you will first see that treats are removed from the carrier overnight. Cats do not learn from punishment or force. Give rewards to encourage positive behavior. It may take days or weeks before your cat starts to trust the carrier. Remain calm, patient, and reward desired behaviors. If you still have trouble, you may need to assess the carrier itself and find a carrier that your cat likes. Your veterinarian can help you with this search. Clean the carrier thoroughly with a non-noxious cleanser, rinse well, and leave in the sun to dry for a day. This can help remove any previously released stress pheromones. Start by putting the carrier in a small room with few hiding places. Bring your cat into the room and close the door. Move slowly and calmly. Do not chase your cat to get her into the carrier. Encourage your cat with treats or toys to walk into the carrier. If your cat will not walk into the carrier, and your carrier has an opening on the top, gently cradle your cat and lower her into the carrier. Another option is to remove the top half of your carrier while getting your cat to go into the bottom half, and then calmly replace the top. It may be necessary to wrap her in a towel to prevent outstretched legs from getting in the way. Leave your returning cat in the carrier for a few minutes to see how all of your other cats react. If all cats appear calm and peaceful, let your returning cat out of the carrier. If you sense tension between your cats, or if previous home-comings have resulted in conflict, keep your returning cat in the carrier and take her to a separate room to avoid potential injury from an upset cat. Provide food, water, and litter box for a minimum of 24 hours while she regains the more familiar smell of home. If there is still stress after this time, contact your veterinarian for more advice on a slower introduction or medication to help the process. Use familiar bedding or clothing with your scent, as it retains the smell of home and helps with reintroduction. Use a synthetic feline pheromone (Feliway®). 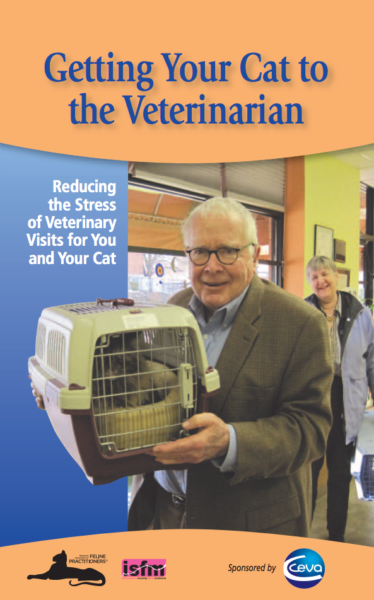 Bring both cats to the veterinary practice together. This can prevent future conflict as both cats will carry the scent of the clinic.